A few of our favorite vines and annual flowers to add big impact to a small space (like that area around your mailbox). Listed below are some plants that’ll know the socks off the mailman. Focus primarily on drought tolerant plants that can handle not having the hose brought out to them every evening. Tried and true mailbox annual. 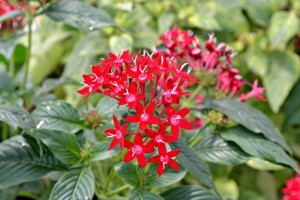 These tropical plants need lots of sun and will bloom best in full summer heat. They can reach 5-10 feet in vining height very quickly, and will provide a dramatic flower bed very quickly. They are easily vining, but can excrete a sap when pruning, so be careful getting clothes dirty as you prune. Rapid grower that can be planted in a multitude of soil conditions and will not come back the next year so no fear of seeding out and spreading. Beautiful flowers regardless of watering consistency. Can handle all day sun and excessive heat from the summer and road near the mailbox. 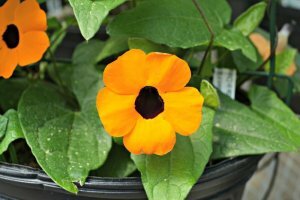 Many of the varieties will have a black eye giving them their nickname of black-eyed susan vine, even though there is no relationship beyond the color of their respective eyes that is shared between the two families. With that eye, the outer ring can be many different shades of reds, oranges, and yellows allowing you to pick what looks most striking with your existing landscape. More mounding habit than Mandevilla. The majority of the plant will remain at the base of the mailbox if you want to provide more access to the mailbox. 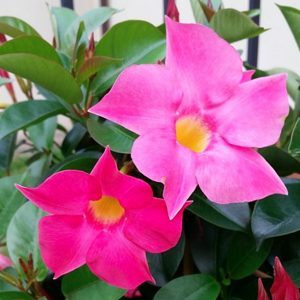 These familial relatives to mandevilla will not overpower a more petite mailbox but still blooms heavily in the heat of the summer. The blooms do attract hummingbirds and bees, introducing pollinators to the front landscape. Aggressively growing annual/perennial that can easily reach the height of the mailbox in short time and fill out behind the stand with ease. Moonflower will bloom overnight and into the early morning as you leave for work giving a good look to the mailbox. Morning glory will develop large 2-3 inch blue blooms with a white throat. 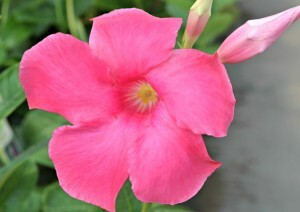 Both varieties are in the Ipomoea family and are toxic to both animals and children if eaten. That taken into consideration, the vine is a fast and attractive grower. Beyond vines, many mounding annuals make perfect mailbox plants. These varieties can stand missing a watering or two if you go on vacation, but will not have any problem with summer showers, or august heat. Mailboxes are a good place to experiment with large varieties of annuals that can reach their full size very quickly. My personal favorite would be the lantana ‘havana’ series; the low seed head count makes the clean-up of these drought tolerant annuals a breeze, and the butterflies that are attracted to them are an added bonus.